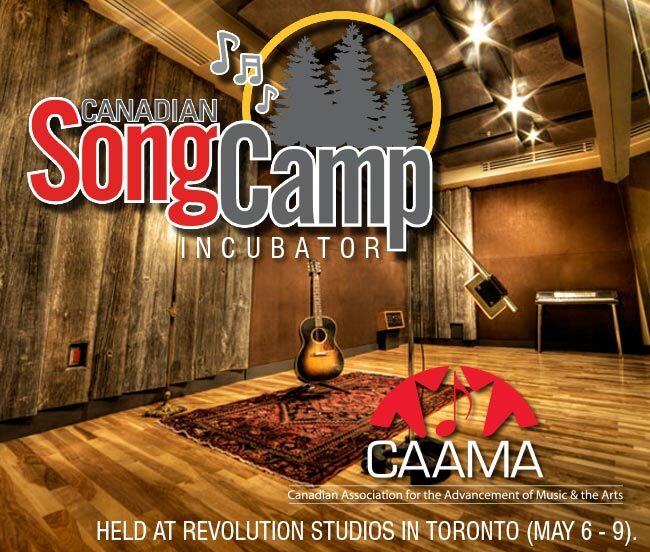 This year Canadian Music Week hosted the first ever Canadian Song Camp, a week long songwriter incubator held at Revolution Studios in Toronto (May 6 – 9). The workshop consisted of ten songwriters, four internationally acclaimed songwriters from Nashville – Dave Berg (Blake Shelton, Keith Urban), Greg Becker (Carrie Underwood, Rascal Flatts), & Justin Weaver (Jason Aldean, Gary Allen), along with Hall of Fame master lyricist Ralph Murphy, and six of Canada’s hottest new songwriters! Songwriters were given instruction to write for a specific artist or artists, or for a specific project. Placed into groups of three, each collaboration consisted of one Nashville songwriter, to write for that day, with all groups overseen with input by Ralph Murphy. At the end of each day the songs were recorded with a top-notch producer to enhance the creative output of the recorded songs, and the process was repeated over the following two days. At the end of the week final songs were pitched in front of a live audience on Saturday May 9th at the Sheraton Centre. The panel included discussing how the song came together, the experience of co-writing for a specific project, the experience of working with Nashville songwriters, industry professionals and more. The songs were played for A&R and publishers to see if the songs fit the targeted project, and finally played for film and TV music supervisors for feedback on their current projects. Canadian Music Week is excited to share the results of our first ever Canadian Song Camp with CAAMA members and CMW15 delegates! Please click on each song title below and enjoy! Please click on each song title below and enjoy!